Mangaluru, Mar 22, 2019: Today is world water day. 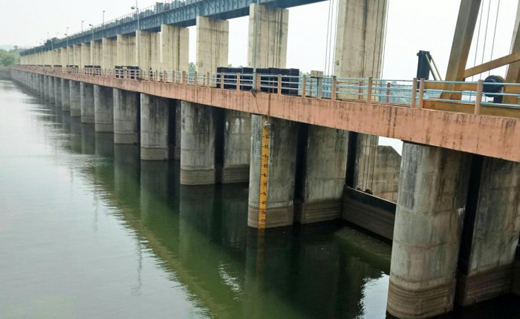 Water level in the Thumbe vented dam which supplies drinking water to Mangaluru city is low, from 6 metre to 5.45 metre after the inflow of water from the Netravati to the dam came to a halt. About 160 MLD of water is pumped to the city daily from Thumbe, about 40 MLD was lost between Padil and Thumbe. In fact, about 200 MLD (million litres a day) of water was being used daily, including by the Mangaluru City Corporation, Mangalore University for its campus, Bantwal town municipality and farmers from Thumbe. The water from the dam is also supplied to Ullal and Mulki as well. The MCC officials had already visited AMR Power Pvt Ltd’s dam at Shambhoor, Disha power project dam near Kadaba, Sagar Power project dam at Uppinangady to assess the water level. In fact, the sandbed of the Netravati river is visible downstream from the Thumbe vented dam. The dam can store water up to seven metres, at present it is stored up to six metres. When water is stored up to a height of 7 metre, the volume will be 14.78 MCM of water in the dam. At present, only 10.83 MCM is stored in the dam. The vented dam is 343.50 metre long and had 30 automated gates. Last year, the water level during the period was 5.7 metre. If the water-level declines drastically, then water from AMR dam will be released to the river Nethravathi to quench the thirst of the citizens. The officials feel that the water supply is not likely to face a shortage. City water tanks : The MCC has been warning denizens not to misuse and waste good water, but evidently it does not take possible and routine action to maintain the main storage tanks in Bendur, which is the main stay of the supply system in the city. A harsh summer is foreseen, yet major leakage from the water tanks are ignored by MCC which a serious lapse and a major waste of water. The storage source at Thumbe dam, after purification at purification plant is stored in tanks before being supplied to consumers/citizens. It is proved, water from two sumps of 50 lakh litres capacity each and located near the Horticulture Department, Bendur, is pumped to different tanks of the Corporation. But, MCC repeatedly fails to address the leakage of lakhs of litres of water from the tanks. As a result, water from the Thumbe dam, which has been made potable at huge cost at public expense, practically flows to waste. This wastage is so for over 2 years, imagine the unprecedented multiple wastage. MCC junior engineer admitted that the Bendoor sump, which is almost two decades old is leaking. He said a solution by expert assistance is awaited.